All prices include: transfers, accommodation and meals; all as listed. The south Adriatic islands and towns are filled with history, culture, beauty and tranquillity. Island hopping aboard a small-ship cruise allows you to visit some incredible places and enjoy the freedom of the open sea. 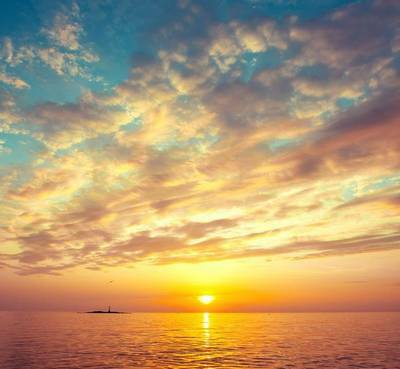 With amazing coastline, beautiful islands and inviting waters, this is an idyllic holiday. This is a really exciting adventure. Getting to visit all the best bits of the Adriatic coast and travelling from islands to cities with beautiful beaches in between is incredibly worthwhile. Travelling via small-ship is definitely the best way to do it. 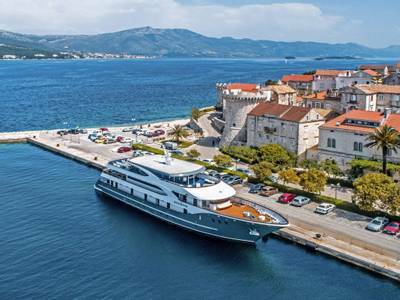 Step aboard for a seven-night small-ship cruise holiday to see some of the most beautiful islands and towns in Croatia such as Dubrovnik, Hvar, Korčula and Pomena. Sailing from one charming spot to another, you can bask in the sun and enjoy a swim in the blue shimmering waters along the way. Please note: a tourist and harbour tax is payable locally when you leave the boat. This costs approximately 28 euros per person for the week. The Croatian islands that are dotted along the Adriatic Coast are home to beautiful beaches, secluded coves and charming towns and villages. You will sail from the ancient and beautiful town of Dubrovnik to a variety of islands and towns filled with history, culture and beauty. 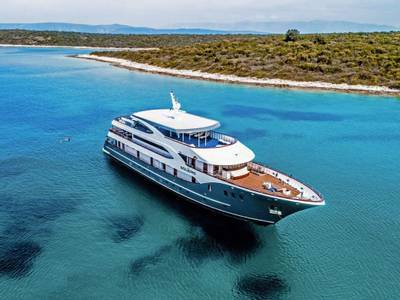 The pace of this Croatia cruise holiday is relaxed and you are free to sit back and unwind on the deck or head out to explore the sights that you will be visiting along the way. Sailing through the Adriatic and along the coast of middle Dalmatia, the vistas are simply stunning. With jagged mountains, rolling hills and pine-covered islands, this is an idyllic part of the world. You’ll get to visit places such as Korčula, supposedly the home of the great explorer Marco Polo, and home to one of the finest medieval walled towns in Croatia. Another stop on the way is Mljet Island, a national park and home to a variety of flora and fauna, as well as a former Benedictine Monastery. The island is so beautiful that it is believed to be one of the islands that Odysseus is stranded on in Homer’s epic. Bursting with history and legend, this part of Croatia is also home to some incredibly cosmopolitan towns and cities that are filled with vibrant restaurants, cafés and bars. You’ll be visiting Hvar and Dubrovnik, which have some of the most buzzing atmospheres in Croatia and are great places to soak up the culture, unwind and relax. 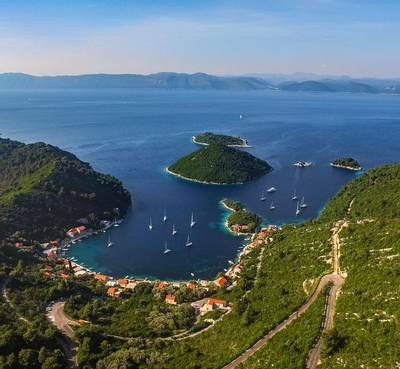 On top of all this, Croatian food is delectable: fresh seafood, gorgeous salads and flavoursome local wines and beers help to make this one of the most enjoyable destinations on offer, so get those deck shoes at the ready! 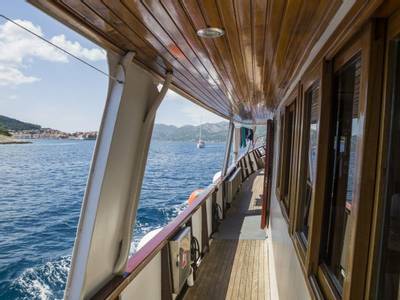 After arriving into Dubrovnik, you will be transferred to the harbour where you will board your small ship and meet the Captain and crew, as well as your fellow passengers. The ship will be your home and sleeping quarters for the next seven nights. Tonight you will be dining on-board and the boat will remain docked in Dubrovnik, so you will have the evening to explore this beautiful Mediterranean city. 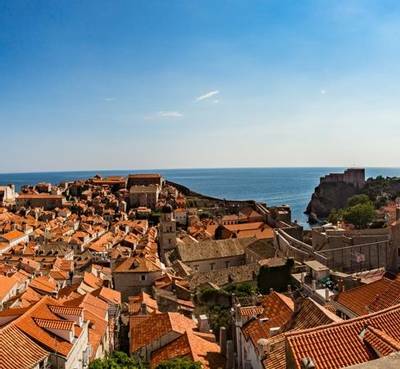 After breakfast you will have a full day in which to explore the wonders of Dubrovnik with its unique cultural heritage. 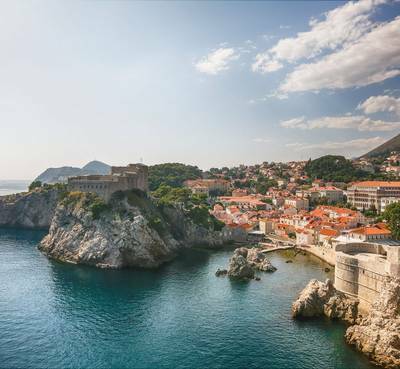 With its medieval walls, terracotta-tiled buildings and crystal-clear waters, you can understand why Dubrovnik is often referred to as the 'Pearl of the Adriatic'. Be sure to take in some of the local cuisine as you walk by the ancient walls and discover its local museums, galleries and shops. The city is renowned for its vibrant and charming atmosphere and its guests are sure to fall in love with it. Lunch is served on-board the ship, so be sure to pop back and enjoy it inbetween sightseeing. 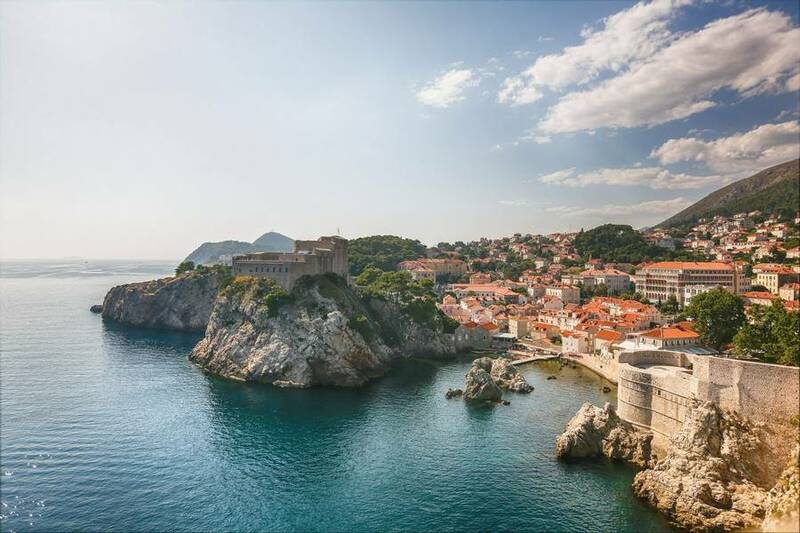 You will spend the night once again docked in Dubrovnik before your sailing adventure begins. Today you may also wish to book a three hour shore excursion (payable locally) to the traditional village of Čilipi. Here you can explore the Sunday market and witness the traditional songs and dances of the costumed dancers as you browse for some authentic local souvenirs and enjoy rhythms of Dalmatian music. 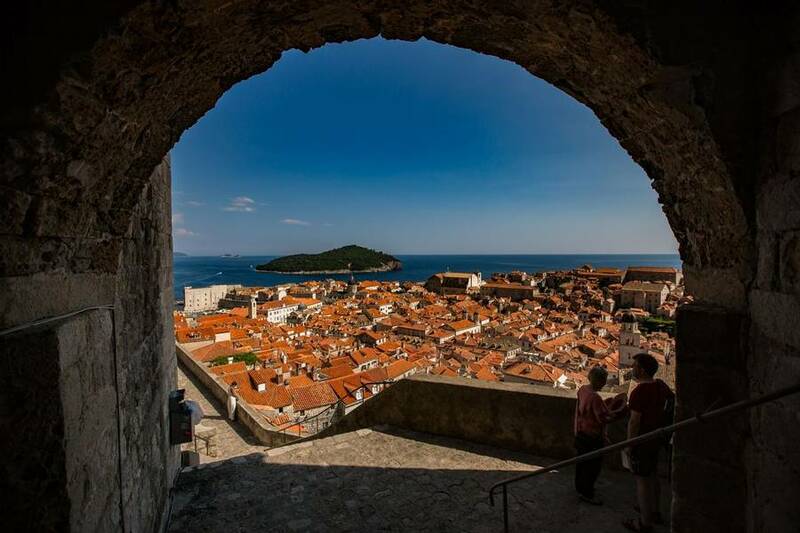 Alternatively, an hour and a half Dubrovnik excursion can be booked where you will be given a guided tour of the city and learn about its fascinating history (payable locally). 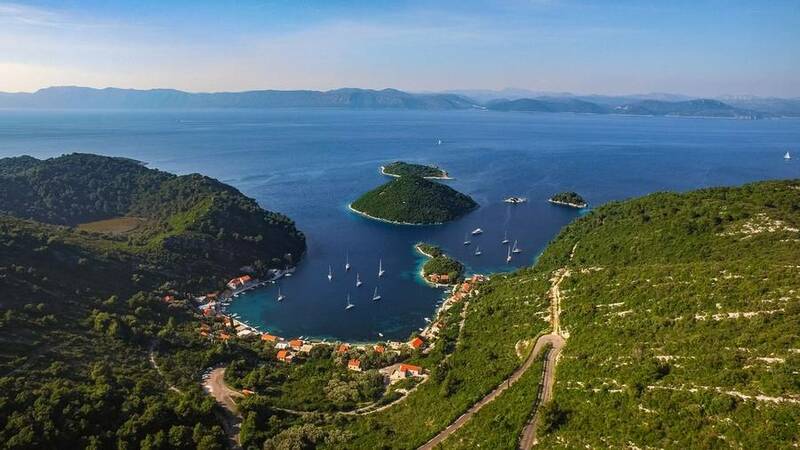 Following breakfast on the boat in Dubrovnik, you will set sail to Pomena, a hidden port on the secluded island of Mljet, a protected national park. Mljet is said to be one of the islands featured in Homer’s epic ‘The Odyssey’ where Odysseus is shipwrecked and becomes stranded. You’ll have the chance to explore the island and the legend, walking through the trails of this stunningly-beautiful national park. Head through the forest of pine and oak towards the two saltwater lakes that are on the island; one even includes a former Benedictine monastery on its own private island, which can be reached via small boat. Alternatively, go swimming from the boat into one of the many secluded swimming spots dotted along the shores of the island. Lunch will be served on board today. Entrance fees to the park are payable locally (approximately 115Kn, or £14). For dinner tonight, why not head into Pomena, which houses a few local restaurants serving delightful food and drink. Alternatively, there is a barbeque dinner on the ship which you can pay for once onboard (approximately £18 per person). 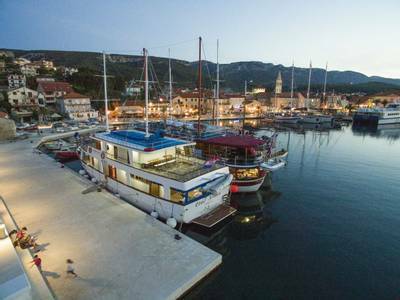 After your night anchored on the shores of Pomena you will have breakfast on-board and then set sail for the town of Jelsa on the island of Hvar. 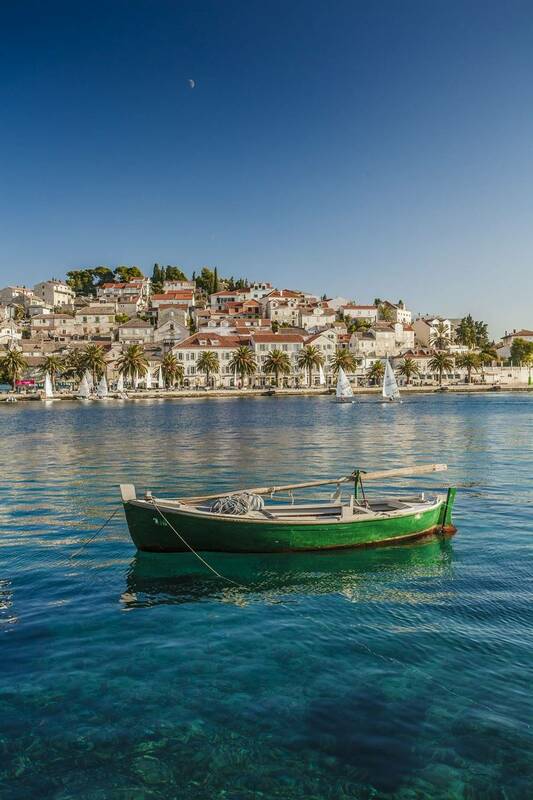 Once a centre of the Venetian Republic, Hvar was considered one of the most important harbours in Dalmatia. 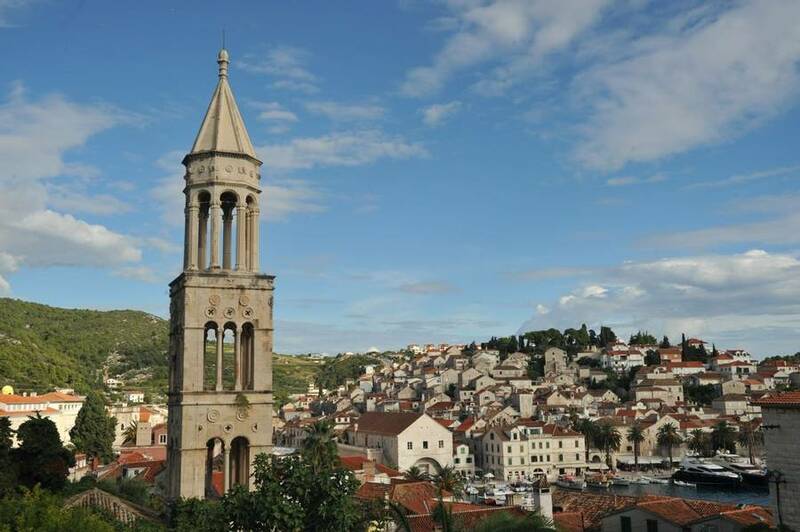 Today it is a cultural hub, filled with vibrant cafés, restaurants and bars and home to some incredible architecture, such as the Franciscan monastery and the amazing citadel fortress. Lunch is served onboard and you will then have the afternoon and evening free to explore this buzzing town and take in the stunning sights. Walk through the charming cobbled streets and soak up the culture and history as you weave your way through the maze of buildings. 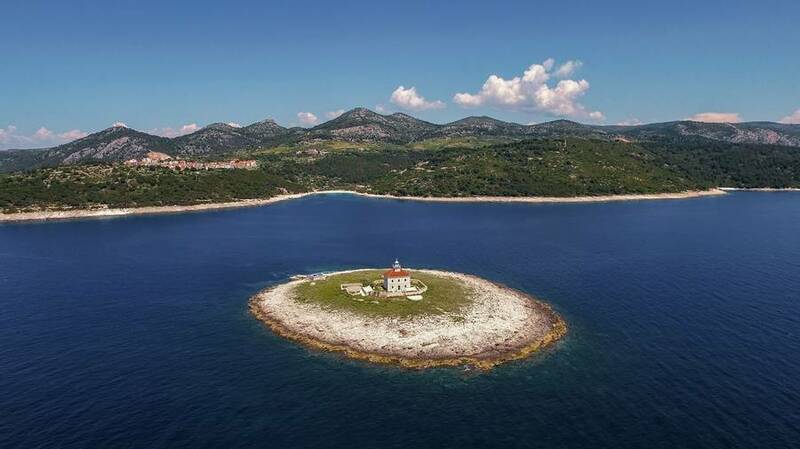 After some free time, you will return to the small ship in order to depart for the island of Brač. You will make port at Bol, the oldest town on Brač’s coast, and home to Zlatni rat, one of the most stunning beaches on the Adriatic. A gentle wander along the seafront promenade leads to this spectacular section of golden pebble beach and crystal clear azure water. Old monuments, the 15th-century Dominican monastery, Vidova Gora Mountain, and charming narrow, cobbled streets, all add to the allure of this coastal town. The range of restaurants is also a delight and so take your time to walk around and find one that suits your taste for dinner tonight. From delicious meats and juicy salads to grilled seafood and freshly baked thin-crust pizzas, there is something for everyone here. You will remain docked here for the night, so feel free to enjoy Bol late into the evening. Today, you will head for a morning visit to Zlatni Rat itself. Known as the ‘Golden Horn’, this large, golden pebble beach stretches into the sea in the shape of a horn. You can enjoy the stunning surroundings here, as well as a dip in the sea if you wish. With the highest mountain on the Adriatic Islands behind you (Vidova Gora at 778m), this is a stunning location to moor. A fresh lunch will be served onboard and then you’ll sail on towards the passage of Splitska Vrata, meaning ‘split gates’. This is a strait in the Adriatic, named after the town of Split, which is your next destination. In your free time, you can enjoy Split’s stunning harbour, awe-inspiring Roman architecture, bustling squares and colourful daily market. Strolling through the charming, cobbled Old Town can keep you occupied for hours, especially as this cultural hub is lined with restaurants, cafés and shops to enjoy. The boat will remain docked here overnight, so feel free to relax on the harbour front and find somewhere fantastic for dinner. A personal recommendation of ours is a restaurant called Trattoria Tinel, which has an elegant interior décor and offers exquisite local dishes. 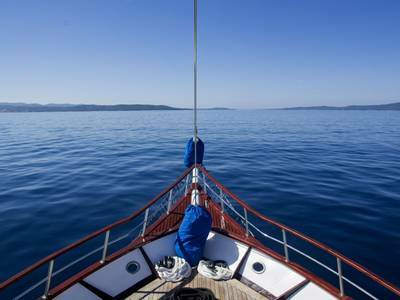 Following breakfast onboard, you will set sail east, towards the Strait of Peljesac and the island of Korčula. 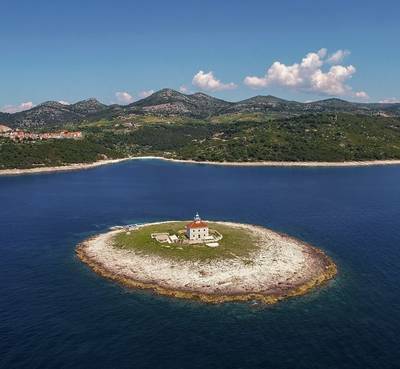 The main town, named after the island, is supposedly the birth place of the legendary traveller Marco Polo and is also home to some of the finest medieval fortifications in Croatia. Inside the medieval walls lie a myriad of historical and cultural delights, including medieval squares, churches, and stone buildings and an enchanting Old Town. From around mid-June through to September, it is not uncommon for mini-festivals to line the streets, which can mean art exhibitions, musical and dancing performances, fishermen’s evenings and folklore evenings. 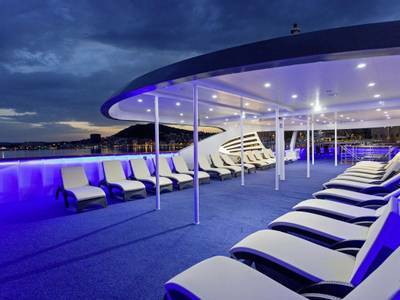 You will have all day and night to savour your surroundings, as you remain docked overnight. Lunch will be served on board, and you may also opt to book the 90-minute shore excursion which can be booked and paid for locally. With a fortified, cobbled headland, filled with restaurants and bars that look out to sea, this is a simply stunning location. Dive into the sea from the local beach, or swimming platforms and then pop into a wine bar to sample some local wines and cured meats. Or, head up into one of the turrets to watch the sun go down with a cocktail in hand. Authentic pizzas, pasta and fresh seafood are plentiful here and you’ll be spoilt for choice when it comes to picking somewhere for dinner tonight. 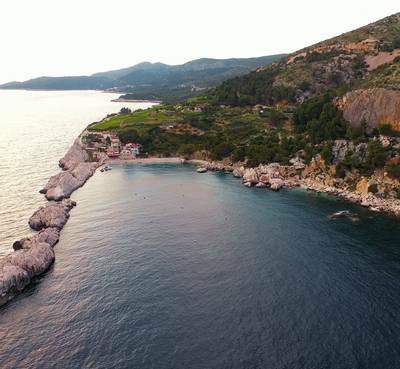 Today you will set sail past the biggest peninsula in Dalmatia, Pelješac Peninsula, renowned for its shaded slopes, which are the beginnings of some of the country’s most famed wine exports. As you sail further down the Miljet Strait you will come to the Elaphiti Archipelago, a beautiful cluster of 14 islands and Islets, whose natural beauty have been a source of delight and comfort to visitors for centuries. 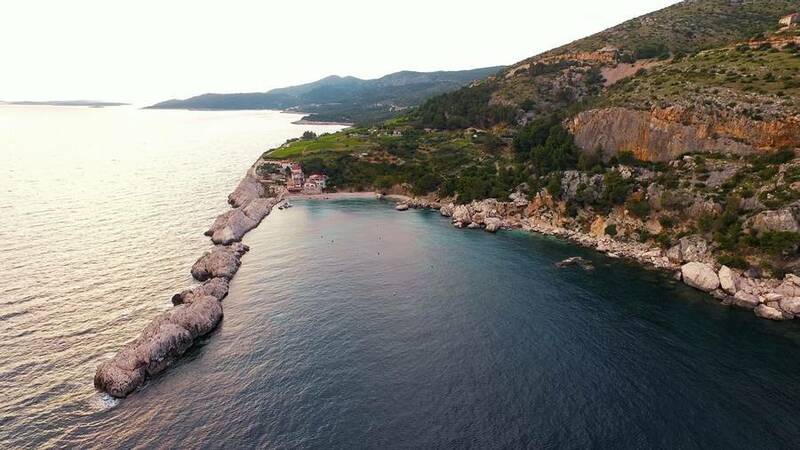 There will be stops for you to take a dip in the sparkling waters and gaze upon the beauty of the beaches, olive groves and pine forests that cover these islands. Lunch will be served on-board and tonight on your penultimate evening you will be docked in Slano, a small peaceful fisherman’s village, set in the wide bay of the Adriatic coast and home to a handful of shops and traditional tavernas. For dinner tonight, you can either explore the town and try one of the local restaurants for some delectable seafood, salads and pizzas, or you can dine on-board and enjoy a farewell dinner which is payable locally (approximately £30 per person). After breakfast, those with morning flights from Dubrovnik will disembark at Slano and be transferred to the airport for your flight home. 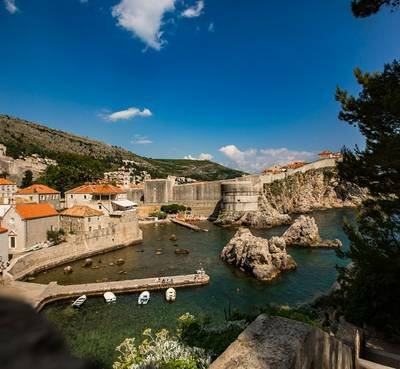 If you have a later flight, or are extending your holiday, you will cruise back towards Dubrovnik, sailing below the mighty city walls of the old town. 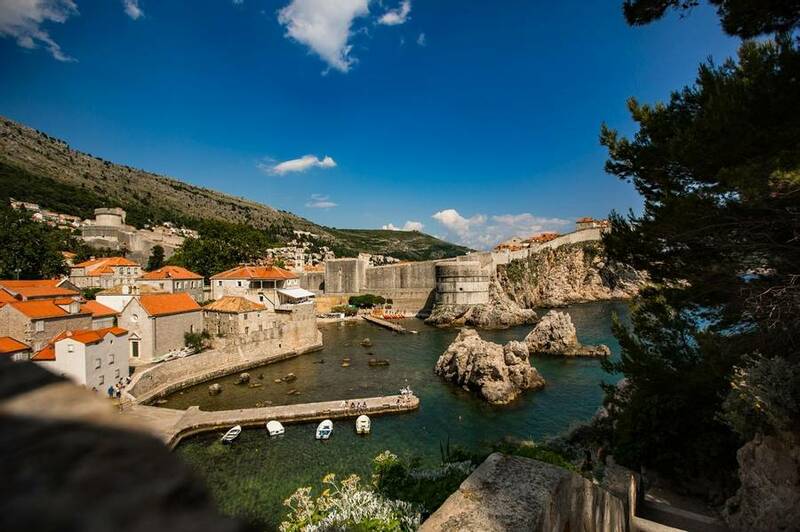 At Dubrovnik you will sadly have to disembark and say farewell to your ship and the crew. After seven days of travelling, you’ll no doubt be sad to leave, but perhaps you can start planning your next adventure out on the Adriatic! You will be transferred to the nearby airport of Dubrovnik for your flight home. 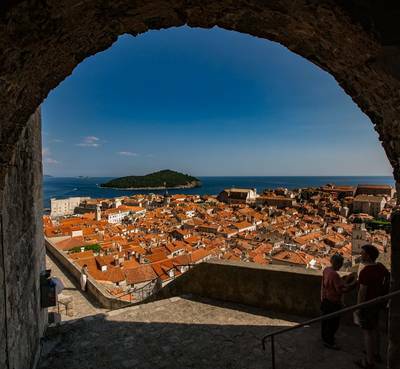 Alternatively, why not extend your stay and explore the charming city of Dubrovnik, filled with history and atmosphere? 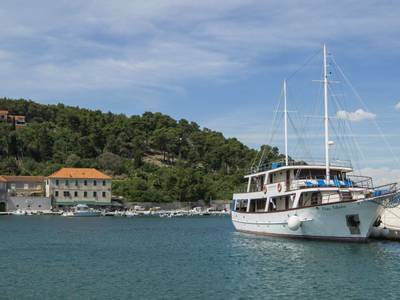 During your cruise along the Croatian Coast, you’ll stay aboard the Otac Nikola which can accommodate just 32 passengers. The size of the vessel means you’ll visit exclusive places that big cruise ships simply can’t reach. 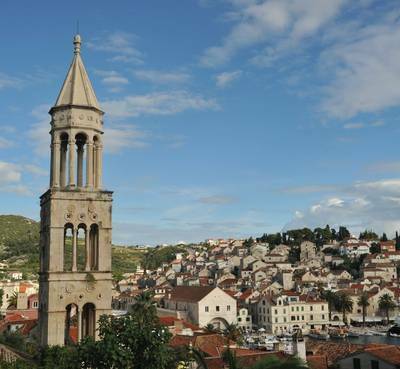 You’ll explore national parks as well as the historical cities of Jelsa, Makarska, Korčula, and Dubrovnik. 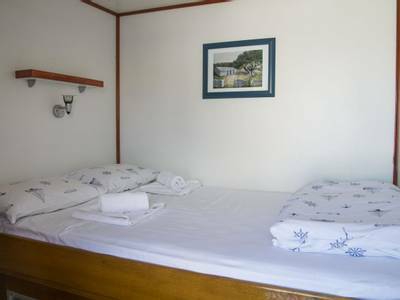 You will stay in a two or three-bed cabin equipped with private shower, toilet and air conditioning. 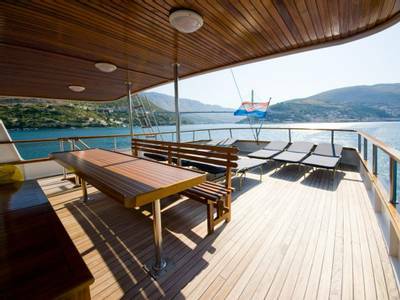 There is also an on-board bar and sun deck to relax and really enjoy the best of the Croatian weather. Just make sure you’re looking out at the sights around you. The views are fabulous regardless of whether you are looking at the mainland or the islands. 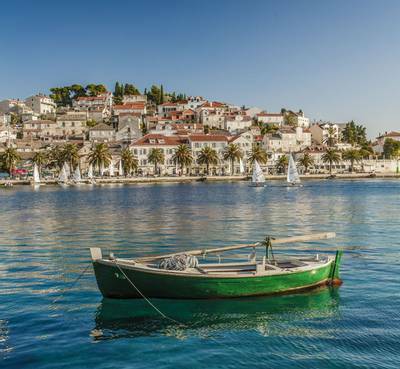 Inland, there’s a formidable backdrop of the towering coastal mountains which give way to verdant vegetation then red-roofed towns and villages then the perfectly blue Adriatic. Looking out towards the sea is just blue, blue, blue. The blue of the sea, the bluey/grey of the islands and then the sky. It’s 360 degrees of stunning. Your stay will be in a two or three-bed cabin. They are equipped with air-conditioning and a private en-suite shower and toilet. There is also the option to upgrade to a main or upper deck room depending on availability. Please ask at the time of booking to secure your place. Please note: due to specific requirements in some of the harbours, it is possible that ships will be tied sideways to each other and that passengers will need to transfer from one ship to another in order to get to shore. Please be careful when transferring from ship to ship and should you need assistance, the crew members will be delighted to help. 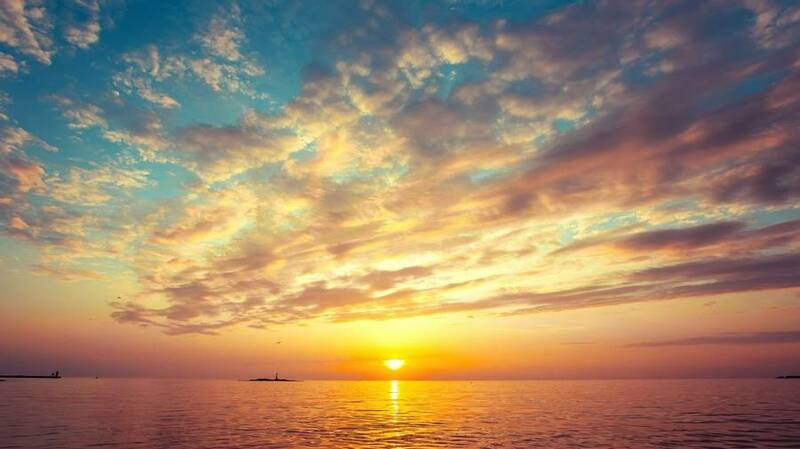 All boat routes are dependent on the weather and may be changed at the Captain’s discretion. You can choose to upgrade your stay to the MY Solaris. 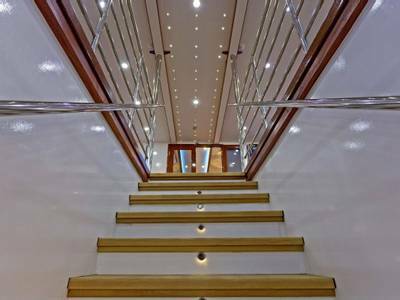 This stylish and comfortable 44m yacht, just built in 2018, can accommodate 38 passengers and adds a luxurious touch to your Adriatic cruise. The Solaris offers a modern design with spacious cabins and an elegant 250m² sun deck with plenty of room to relax. There’s also an onboard saloon with air conditioning for you to enjoy a drink in the shade. 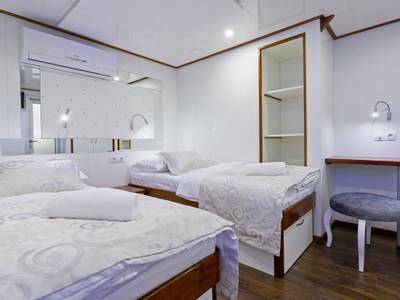 Your roomy two-bed cabin comes equipped with air conditioning, LCD TV, desk and free WiFi. 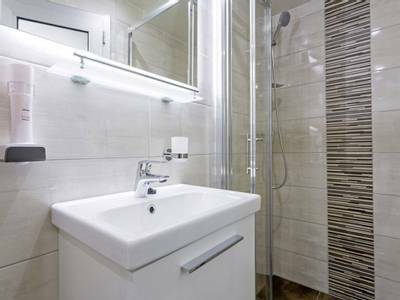 You’ll also have your own private bathroom with toilet and shower. The cabin size is approx. 12 m² including the bathroom. With plenty of Croatian towns, cities, islands and beaches under your belt, you really need to add Split to the list and spend some time enjoying this magical city. Filled with beautiful architecture, a stunning seaside promenade and the amazingly preserved UNESCO World Heritage Site of Diocletian's Palace, this is a place not to be missed. A short shuttle or taxi ride from the centre of Split and situated on the beach front, stay at the Hotel San Antonio in Podstrana for a relaxing night or two. Read more was safe and a 2 min walk from where we had to board the ship and disembark. Thank you. The scenery was wonderful and this early in the season places were quiet which suited us. The local guide and crew were friendly and helpful. Read more never done anything like this before, a boat cruise or Croatia, so didn't really know what to expect. The boat was fairly small (a good thing) with about 30 occupants and therefore it was a small crew of about 6 people which meant you got to talk to them all and get to know them. The chef was Italian and the food we received was absolutely incredible. When we heard we were going to be getting breakfast and lunch each day we thought it would be a sandwich based lunch but in fact, we got three-course meals every day! This meant we didn't really need to buy any extra food (we did though just to try the local cuisine). We normally keep ourselves to ourselves on holiday but we sat with a couple from New Zealand on the first day and ended up making very good friends and we are now planning to travel to New Zealand to stay with them. There was a large variation in age on the boat, my husband and I in our 20's and ranging up to roughly 75 but this was fine as you could plan whatever you fancied on shore - my husband and I opted for higher energy activities each day but you could have easily chosen to wander slowly round the town or stayed on the boat admiring the views. Everything was incredibly easy from travelling to eating to planning our days so no stress. I am so happy I booked this and for the price I paid it has massively exceeded my expectations. Read more with other guests from Scandinavia, France and Germany. There was an opportunity to hire cycles at most islands which was a nice change from lounging on deck!